Urghhhh. I have been so ill this week, which coincided with me freelancing at a new company whom I wanted to impress and continue working for so I’ve been rather run down. But it’s Friday evening and the client seems happy with the animations, so happy days! I’ve been forced to do a lot of overtime so I decided to give my slow cooker a whirl while I was at work so I could just head home to eat with the little energy that I had and head straight to bed loaded with paracetamol. 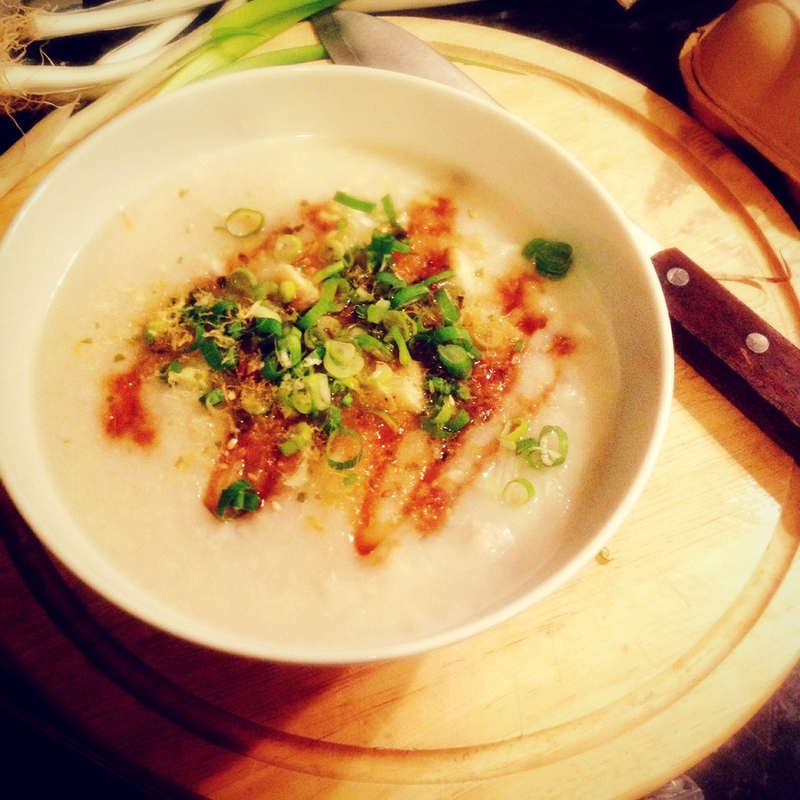 It worked I think, in that I managed to produce silky smooth congee that reminded me of the comforting healing flavours of my childhood (mmmm….rice gruel) as well as reducing that cooking time and allowing me to rest more. This is a recipe for a basic congee, it’ll do 4-6 servings depending on how hungry you are. To this I added some fish at the very end, but we’ll get to that bit later. Super easy. Use a meat tenderiser mallet or the flat side of a cleaver and smash that pealed ginger a bit to release more flavours while you cook. Whack the ginger, rice and water into the slow cooker and set it on low for 8-12 hours. Your basically done! Season to taste when ready. Mine needed a cup more water after a 12 hour shift so adjust accordingly really, but it’s super simple to then portion out what you want to eat in a small pot on the stove to make it the perfect consistency. This technique is also good because congee usually forever to cook nicely without rice water bubbling everywhere, so my mother will be pleased to note that this is a very clean and hassle free way of cooking jook. To this basic recipe you then what to add other ingredients. Classics like pork with thousand-year old egg and numerous other combinations come to mind. But I only had a bit of fish in my fridge so I sliced the fillet diagonally, and marinated that with a bit of cornstarch, soy, white pepper and thinly sliced ginger. Then I cooked it very slowly over low heat and served with spring onions and a splash of soy and sesame oil. But I love this comforting rice gruel so I’ll post more recipes along this congee tangent later.